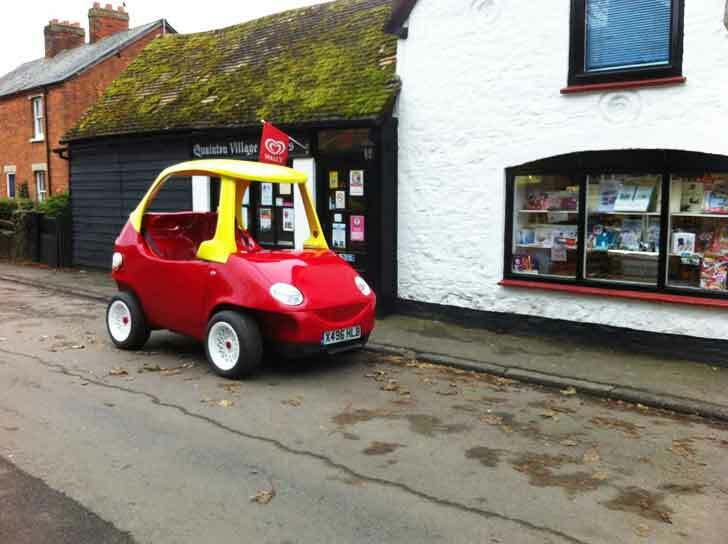 Mechanic Builds One-of-a-Kind, Adult-Sized Little Tikes Cozy Coupe That Can Reach 60mph! Although aging is inevitable, maturing is clearly optional. English mechanic, John Bitmead knows that nostalgic toys have the potential of becoming even more sentimental and valuable as an adult. At the tender young age of 48, Bitmead converted a Daewoo Matiz into an adult-sized replica of the classic toddler Cozy Coupe ride-on toy. Running on an 800cc engine instead of enthusiastic Flintstone-like foot power, the vehicle can reach speeds of up to 60mph in only 17 seconds. Bitmead spent five months and almost $7,000 on his Cozy Coupe, recreating every detail from the yellow roof to glassless windows and oversized drink holders. He decided to build the souped-up version of the iconic toy after seeing so many of them parked in the yards of neighborhood homes. He realized that the Little Tikes car was probably the first experience most people had with driving, and he began the project with his brother Geoff and friend Nigel Douglas as a way to help grown-ups recapture some of the magic of childhood. Bearing an eerie resemblance to a modern Smart Car, Bitmead has taken his creation for a spin down the roads of his hometown and also into heavier traffic. With an airbag, mirrors, and real brakes, the new model is street-legal, although Bitmead wears a helmet when behind the wheel for safety. “We took it on the motorway once, but I’m too scared to do it again in case we cause an accident – people were taking photos of us driving past at the wheel and swerving all over the place when they saw us drive past,” he said. A mechanic for Attitude Autos in Oxon, England, Bitmead continues to make bespoke vehicles for fun and profit. Practical or not, it is amazing to see what can happen when the big kids have more allowance money and an unsupervised access to power tools. Forget the midlife crisis Ferarri, we’ll take the Cozy Coupe instead.